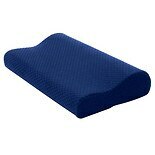 Use a cervical pillow to provide support to your neck while you sleep. You'll wake up feeling refreshed, energized and pain-free. Walgreens.com has cervical pillows from brands like Mabis Healthcare and Carex. Neck support pillows cradle your neck and head while you sleep, promoting good spinal alignment. While traditional pillows simply provide a resting place for your head, cervical pillows actively support your head and neck. This support and proper alignment eliminates pain and discomfort that can result from poor sleeping posture. Neck pillows come in several degrees of support, ranging from soft to firm. 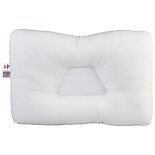 Softer pillows work well for individuals who sleep on their stomachs, while firm cervical pillows are best suited for individuals who sleep on their backs or sides. Cervical pillows come in several different shapes and styles. You can use roll pillows under your buttocks to support your lower back and sacrum, or under your knees to reduce tension in your lower spine. 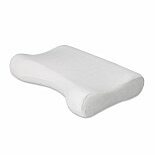 Asymmetrical cervical pillows have one side that is thicker than the other, and work particularly well for individuals who sleep on their sides. If you travel frequently, consider a horseshoe or crescent-shaped pillow. These cervical pillows wrap around the back of your neck and support your head while you sleep in an upright position.